The show Divisive Landscapes, created by Salt Lake City native Sandy Brunvand, opened at the University Gallery on Wednesday. A reception featured free food, live music, and a talk from the artist herself. The majority of the pieces include a line of typewriter text: headlines from The Salt Lake Tribune that Brunvand started collecting after Trump won the presidency in 2016. Chronicling the past year, the headlines range from TRUMP ORDERS END OF ‘DREAM’ to POLLUTION KILLS 9M EVERY YEAR. Brunvand went on to explain that Utah is a very red state, with Salt Lake City being a little more muted. She looks forward to the reactions Divisive Landscapes will receive when she exhibits her work there. 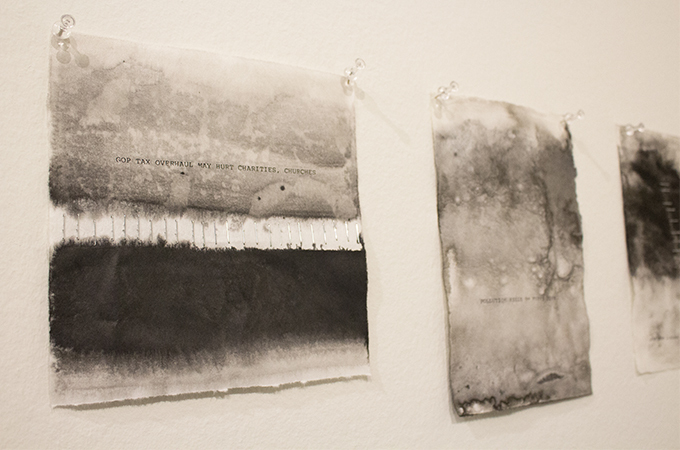 Divisive Landscapes will be on display at the University Gallery on Colton Avenue until Sunday, February 4. The gallery is open from 1–5 p.m., Tuesday through Friday, and from 2–5 p.m. on Saturdays and Sundays. The previous evening, Brunvand’s husband, Dr. Erik Brunvand, director of computer engineering at the University of Utah, gave a talk titled “Drawing Machines” in Ann Peppers Hall, also on the Redlands campus. 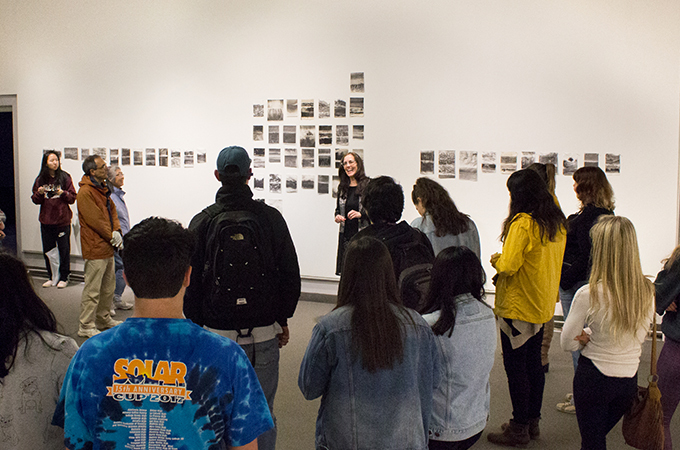 His talk introduced art, engineering, and computer science students to a “different” segment of the sculpture world: sculptures that make drawings. Dr. Brunvand took the audience through the history of drawing machines and showed drawing machines he had developed with his students. 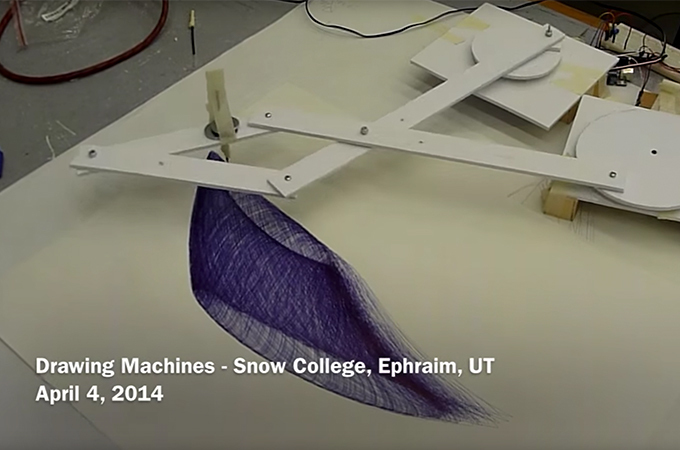 Below is a video of drawing machines built in a workshop that he taught at Snow College in Ephraim, Utah. The next show to be featured in the University Gallery will be Professor of Photography Tommi Cahill’s Hypnagogia, which will open in February.